Many people shy away from pork, because it is often associated with a high fat content and seen as a more "dirty" meat. However, pork made right is very full of flavor. This recipe is one that my mom taught me when I was growing up. It's one of the first meals that I made for my family, and it's a very simple and delicious recipe to make for your family and friends. 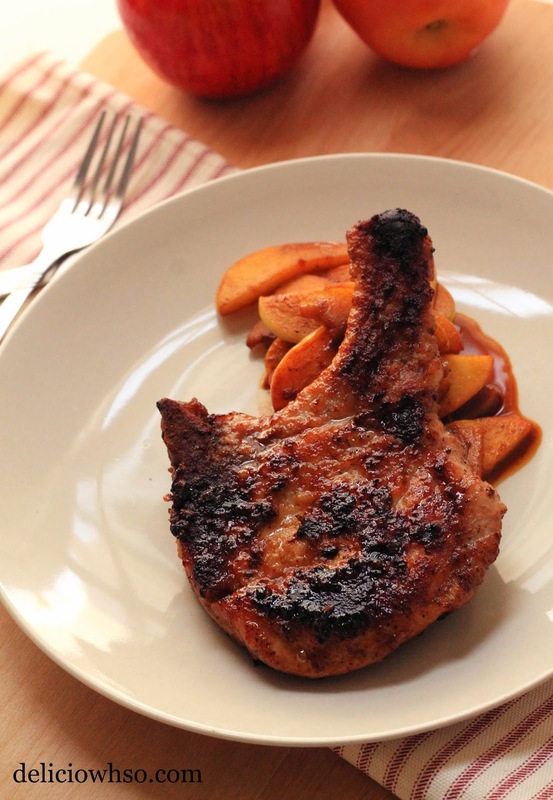 Finish with a little apple to give a fruity, tangy crunch in contrast to the chewy, tender pork chop. Be sure to cook this on medium heat because the sugar will caramelize and then burn. 1. Mix brown sugar and flour together in a bowl with a shallow, wide mouth. 2. Season each side of the pork chops with pepper, garlic powder, and salt. 3. Coat the pork chops completely with the brown sugar mixture. 4. Heat a pan to high, and add 1/2 the butter. Sear the pork chop for 30 seconds on each side. 5. Then, lower the heat to medium-low and cover. 6. Cook for 1 minute at a time, flipping between each minute. 7. The pork should cook for about 5 minutes, depending on the thickness of the meat, it will vary. 8. Remove the pork from heat and slice the apples. Add the slices to the pan and mix with maple syrup. 9. Cook until the apples soften slightly. The most difficult thing about this recipe is temperature control. The sugar will burn easily, but char is not a bad thing. Having a little smoky flavor is fine, but it should be managed. You want color on the meat, so you need a good sear, but controlling the heat after the sear is key to maintaining a proper color. 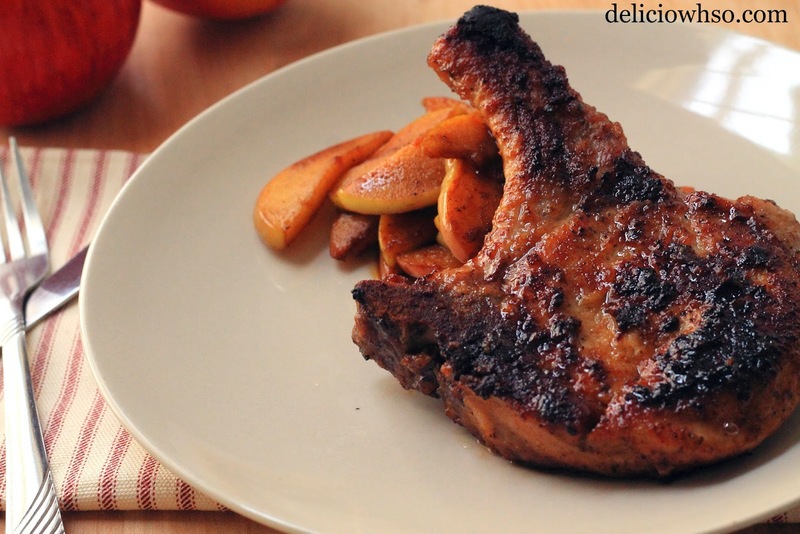 The sweetness gives a great balance to the flavor of the pork, and this recipe is a quick, easy, and inexpensive way to make a yummy dinner for 4 (or more)!